A rare sighting of the Vashon Bog Monster, elegantly attired in a tux for his annual visit to town. 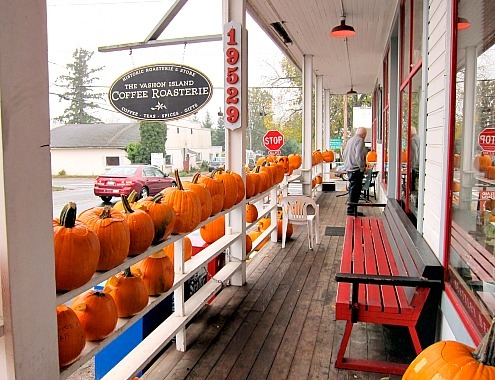 A pride of pumpkins: The Vashon Island Coffee Roasterie bedecks and bedazzles its porch rails with jack o’lanterns galore and aglow, each carved by an island volunteer. When The Vashon Island Coffee Roasterie starts lining up pumpkins on the porch, you know Halloween can’t be far behind. 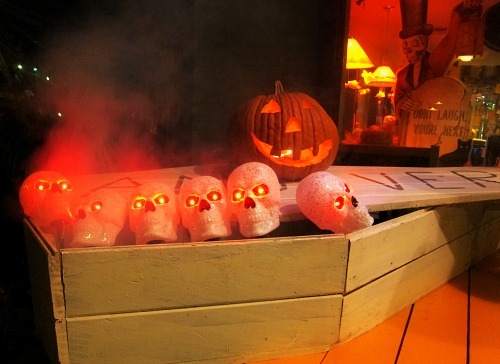 Because island residents are spread out, and dark rural lanes the norm, Halloween is celebrated in the centrally-located, well-lit, easy-to-navigate town of Vashon. Merchants open their doors to hordes of goblins, ghosts, ninjas and fairy princesses, and Vashon Highway is closed for several blocks, becoming a pedestrian friendly promenade for the night. It’s one of my favorite spectacles on the island, kids, parents, kin and crazy revelers take over town, with a community block party that would warm a skeleton’s frame like a dip in a hot tub. 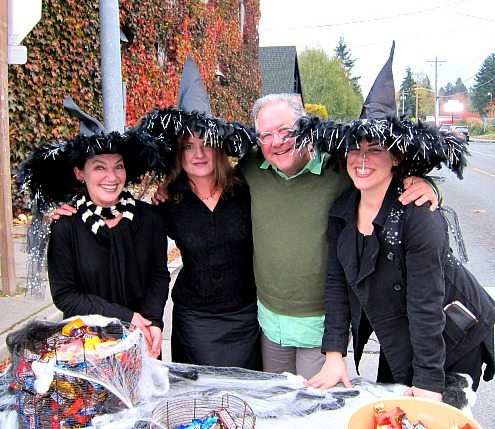 The Witches of Burton bring a little style and a lot of candy to town. 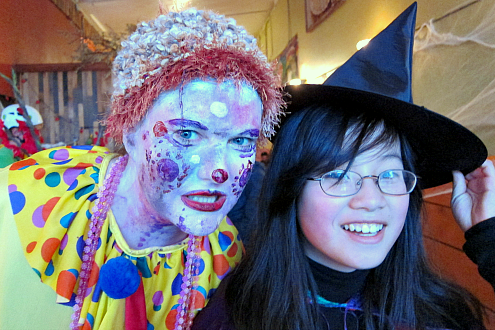 Role reversal: bad clown (sorry Miffy), and good witch. 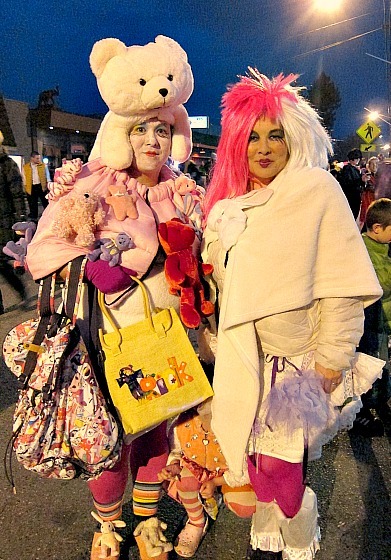 Two of my favorite Vashonistas taking Harajuku excess to a whole new level. Aptly named Zombies Drive-in displayed some patrons who didn’t pay. 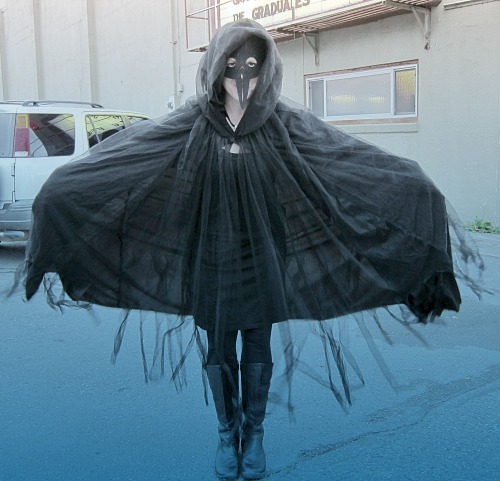 A costume Edgar Allan Poe could embrace, the Raven said. 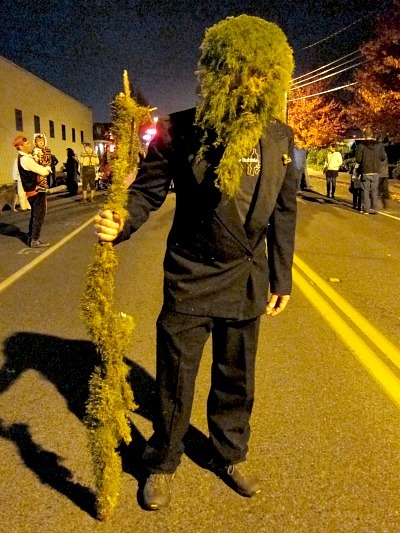 A rare sighting of the Vashon Bog Monster, elegantly attired in a tux for his annual visit to town. (Though one friend said, that’s what she looks like after a winter in the Pacific Northwest. Gracie and Boz opted for an evening in, reminding me that they don’t do dress-up. (Though here I do believe they are disguised as retired guard dogs). As for me, I dressed up as a happy local enjoying the evening. Next year, I’ll get a little more creative, I promise. There are three people in your photo of revelers taking Harajuku excess to a whole new level! A wee one underneath! Good eye! Ms. Sabine was and always is camera-shy. This was fun, Tom I absolutely love Boz and Gracie and cannot get enough pictures of them. Looks like fun! Next year I should come for my birthday! Good idea Laurie, now you just need to come up with costume, then again, so do I.
I think Boz is dreaming of next year’s bow tie and Gracie would rock a pink tutu!! Perri, maybe next year I can convince them to come with me and don a few frocks for their Halloween costume debut. How much fun! The more I read about life on Vashon, the more I like it! Yep Eileen, it’s a pretty wacky group on the island, rarely a dull moment. Thanks for the shoutout Tom! I’m actually working on it since our visit to “our own private Idaho”! Love you, miss you, are you heading east at all????? Hi Miffy, I need to plan my winter escape, so I’ll keep you posted as to my plans and visit to the sunshine state. Always love your pictures and commentaries. Also, love Boz & Gracie. My husband just showed me this little video of bulldogs that you might like. Hi Margaret, thanks for the laugh. 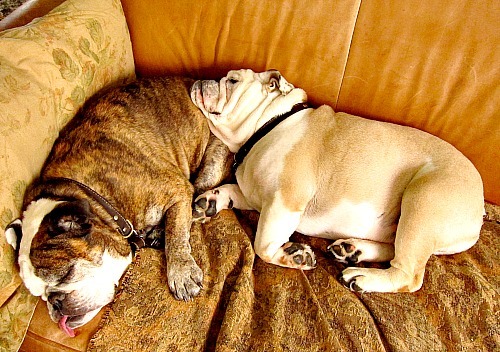 I tell you those little bulldogs have me under their spell. Great pics, Tommy! It’s great to live where there’s such a vibrant community.